The film is set in the year 2026, in the extraordinary Gothic skycrapers of a corporate city-state, the Metropolis of the title. Society has been divided into two rigid groups: one of planners or thinkers, who live high above the earth in luxury, and another of workers who live underground toiling to sustain the lives of the privileged. The city is run by Johhan 'John' Fredersen (Alfred Abel). The beautiful and evangelical figure Maria (Brigitte Helm) takes up the cause of the workers. She advises the desperate workers not to start a revolution, and instead wait for the arrival of "The Mediator", who, she says, will unite the two halves of society. The son of Fredersen, Freder (Gustav Fröhlich), becomes infatuated with Maria, and follows her down into the working underworld. 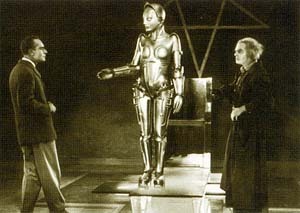 In the underworld, he experiences firsthand the toiling lifestyle of the workers, and observes the casual attitude of their employers (he is disgusted after seeing an explosion at the "M-Machine", when the employers bring in new workers to keep the machine running before taking care of the men wounded or killed in the accident). Shocked at the workers' living conditions, he joins her cause. 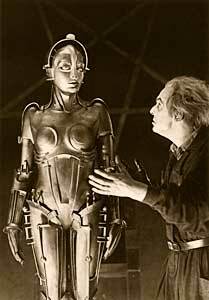 Meanwhile his father Fredersen learns of the existence of the robotic gynoid built by the scientist Rotwang (Rudolf Klein-Rogge) and orders Rotwang to give the robot Maria's appearance. (Rotwang had wanted to give the robot the appearance of Fredersen's dead wife, Hel; both men had been in love with her, but in the end she had married Fredersen). By doing so he wants to spread disorder among the workers that would give him the pretext to carry out a retaliatory strike against them. The real Maria is imprisoned in Rotwang's house in Metropolis, while the robot Maria becomes an exotic dancer in the city's Yoshiwara nightclub, fomenting discord among the rich young men of Metropolis. The workers are encouraged by the robot Maria into a full-scale rebellion, and destroy the "Heart Machine", the power station of the city. However, the destruction of the machine leads to the city's reservoirs overfilling, which floods the workers' underground city and seemingly drowns their children, who were left behind in the riot. (The children are in fact saved in a heroic rescue by Freder and Maria, without the workers' knowledge.) When the workers realize this, they attack out into the gridlocked and confused upper city, foreshadowing the "destruction of the enemy in the citadel" ending still seen in films. The crowd breaks into the city's entertainment district and captures the robot Maria, whom they believe is responsible for drowning their children. They burn the robot at the stake, and when Freder sees this, he believes that it is the real Maria and despairs. However, Freder and the workers then realise that "Maria" is in fact a robot, and see the real Maria being chased by Rotwang along the battlements of the city's cathedral. Freder chases after Rotwang, resulting in a climactic scene in which John Fredersen watches in terror as his son struggles with Rotwang on the cathedral's roof. Rotwang falls to his death, and Maria and Freder return to the street, where Freder unites John and Grot, the workers' leader, fulfilling his role as the "Mediator".